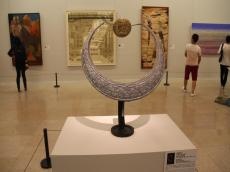 The 7th Beijing International Art Biennale, entitled "Silk Road and world civilization", displays works by Azerbaijani artists. A total of 601 works of 567 artists from 102 countries are put on display. They comprise 411 works from foreign countries (including the special exhibitions) and 190 works from China, covering contemporary paintings, sculptures, installations, images and other multimedia works. The works by Azerbaijani carpet maker Adil Shikhaliyev and sculptor Samir Samadov are among the exhibits, Azertac reported. Azerbaijani ambassador to China Akram Zeynalli attended the opening ceremony of the biennale held at the China National Art Museum and viewed Azerbaijani artists` works. Adil Shikhaliyev's work on a carpet is called "Silk Way" and sculptor Samir Samadov's work made of metal and polyester is called "In the wake of the Sun". The monument depicts camel and Chinese dragon motifs. The exhibition, organized by China's Literature and Art Circles, China's Art Workers Association and the Beijing Municipality, will last until October 15. The exhibition serves as an international platform for artists of the world to show their talents and is attended by hundreds of media representatives, members of the organizing committee and art figures. This year coincides with the 15th anniversary of its founding, and the exhibition will be the first in the world to attract 100 participating countries, showing that its international reputation, influence and attractiveness are increasing, and also adding overwhelming splendor to Beijing, an ancient cultural capital, with features of modern international metropolis.